The University’s Vice-Chancellor, Professor Kolawole Salako on Wednesday, October 31, 2018 clocked one year in office amid catalogue of achievements. Professor Salako held audience and listeners spell bound while reeling out his achievements during a Congregation meeting and FUNAAB Radio Live programme marking his first year in office. The Vice-Chancellor disclosed that three hostels have been completed and ready for commissioning during the Convocation Ceremony, adding that one of them will accommodate postgraduate students while the remaining two are for undergraduate students. He informed that apart from the completed hostels, another one has taken off, pointing out that “Federal Government is trying but the number of students coming into the University keeps increasing over the years. Professor Salako also listed the building of a Cassava Processing Factory between the month of January and March 2018 as another achievement of his Administration. He explained that using some funds from a grant facilitated by the duo of Professor Lateef Sanni and Professor Kolawole Adebayo whom he commended, the University was able to buy some equipment for food processing, and as such expanded the cassava factory in the Industrial Park Unit. According to Professor Salako, other achievements of his Management team are accreditation of courses, curriculum review of courses, commencement of e-registration for students, commencement of full transmission by FUNAAB Radio and staff capacity building through attendance of Workshops and Conferences. The Vice-Chancellor articulated other achievements to include transforming a negative balance in the account of the university to a positive balance as at 19th October, 2018 through the commitment of the Bursar, Mr. Chukwuwinke Ezekpeazu and his Bursary team. 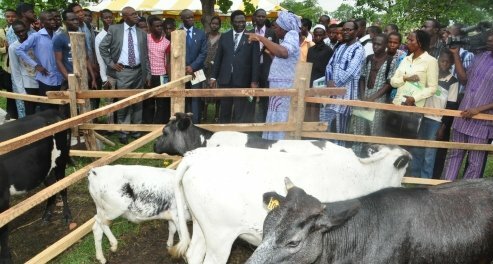 Others are settlement of salary shortfall in 2017, payment of outstanding promotion arrears, increase in the number of FUNAABOT buses, restructuring of Establishment Unit to Academic staff, Senior Staff and Junior staff units, registration of the university groundbreaking research of improved local chicken breed registered by NACGRAB as FUNAAB Alpha and attraction of 110 Laptops donated by NCC among several other achievements. Professor Salako thanked the Federal Government, Federal Ministry of Agriculture and Natural Resources, Ministry of Education, National Universities Commission (NUC), Tertiary Education Trust Fund (TETFund), Donor agencies, partners in linkages, the Alake of Egbaland HRM Adedotun Aremu Gbadebo, Chancellor, Governing Council, Senate and the entire members of the University Community for their support and contributions towards his Administration’s achievements.